Accelerate your time to market! 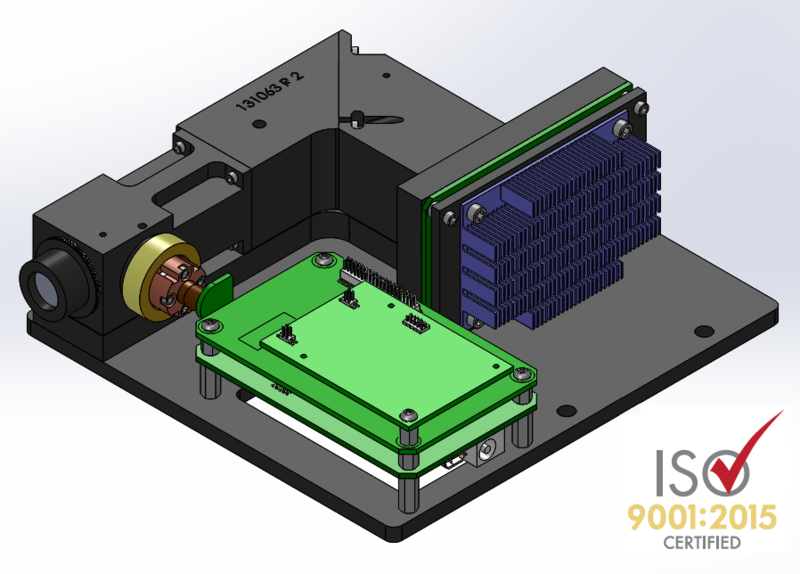 Making the transition from proof of concept to fully designed instrument is a challenge for many new product developments. 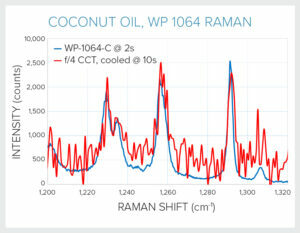 We mitigate that risk and accelerate your time to market with our OEM modules for Raman, visible, and NIR spectroscopy. These drop-in modules form the heart of our standard products – in fact, our optical bench is our OEM bench – allowing you to perform R&D with our standard products and then migrate to the OEM equivalent for prototyping and production with no loss of performance. We developed our ‘OEM by design’ philosophy after working with many OEMs to transition their research into application-specific products. In doing so, we saw a need to meet the core requirements of OEM manufacturers for robust, thermally stable components that deliver repeatable results – from unit-to-unit and over time. We also saw an opportunity to speed the product development process by offering OEM-grade product from the start. 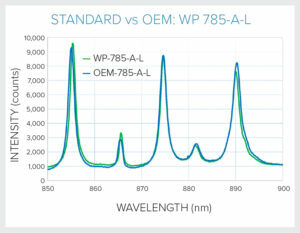 At Wasatch Photonics, our OEMs can perform R&D and proof-of-concept testing with the same easy-to-use modular products and free ENLIGHTEN™ software used by our research customers, confident in the knowledge that the superior performance they see and unique analytical methods they develop can be replicated in volume. Why go back to square one with your product design when you can go direct to integration? 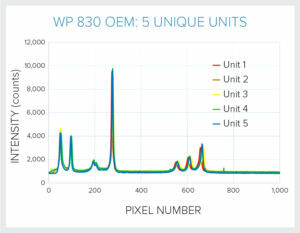 The primary concern OEMs have when migrating to a smaller spectrometer footprint is performance. 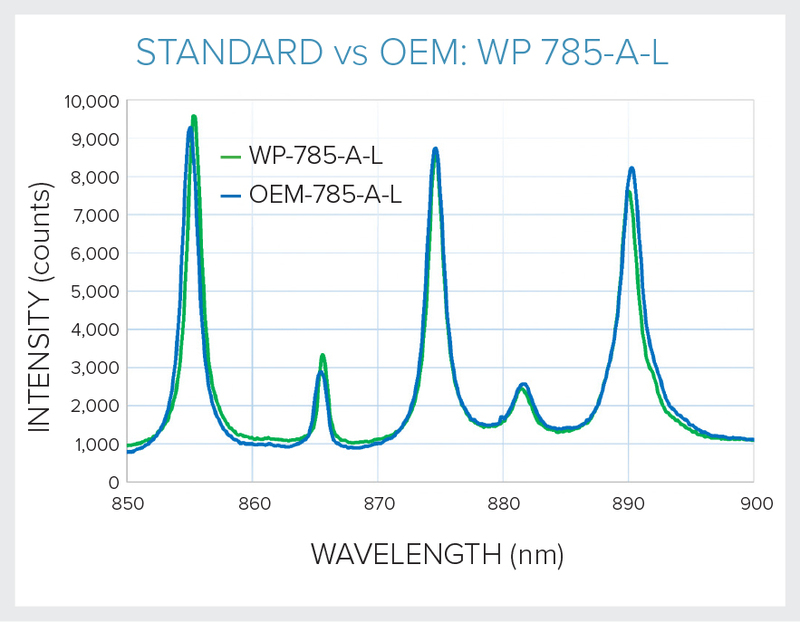 Photons are precious, particularly in Raman and NIR spectroscopy, which is why our standard and OEM products use the same high performance optical bench to capture, keep and detect more photons. 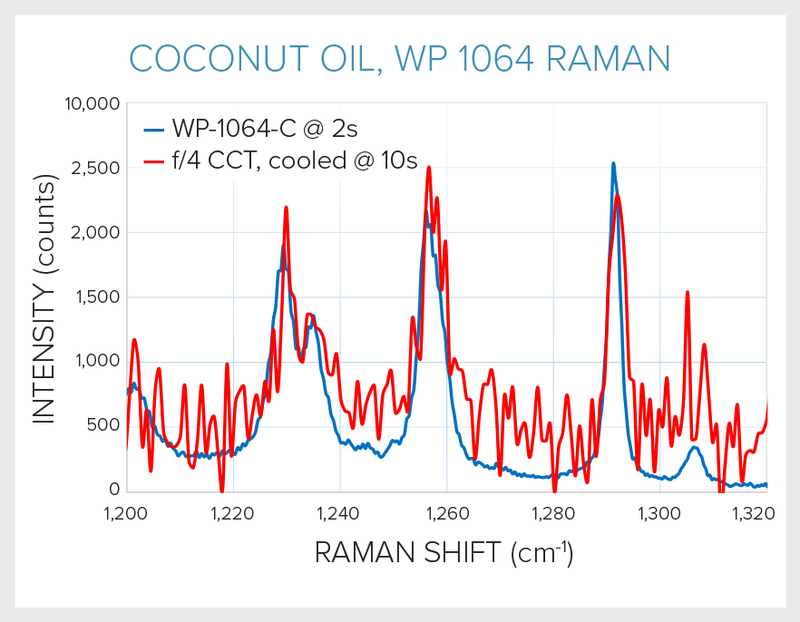 The consistency of spectral response between our standard and OEM products mitigates the risk and time delays traditionally associated with the OEM prototyping process, and aids transfer of chemometric models or Raman libraries for matching. Sensitivity & SNR means little if it can’t be replicated in volume. Our transmissive optical bench design reduces aberrations and minimizes curvature of the image plane, yielding consistently tight focusing across all detector pixels to optimize sensitivity. This design approach avoids the variable spectral reponse tilt issue seen in reflective crossed Czerny-Turner spectrometer designs, and enables us to deliver very consistent unit-to-unit spectral response. 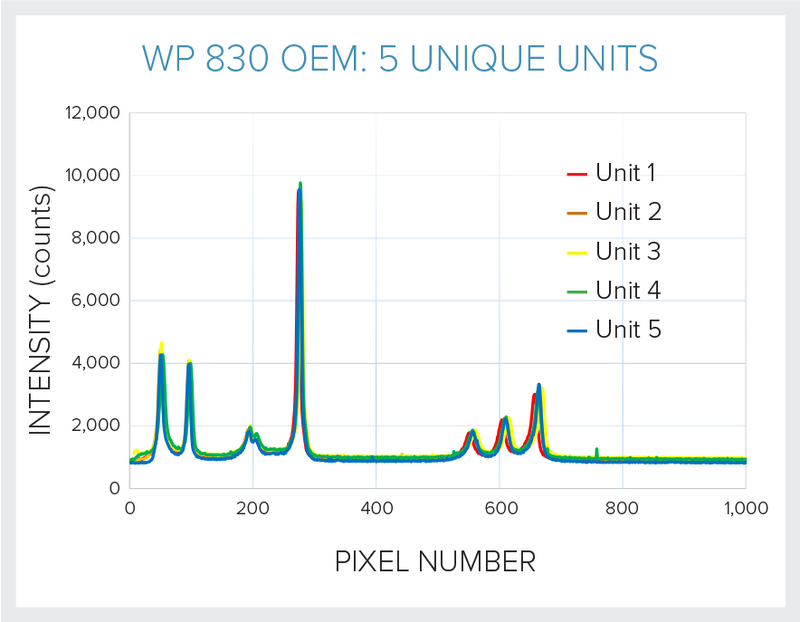 Ask us about spectral matching – we can offer less than ±10% across all wavelengths! Sensitivity and signal to noise ratio (SNR) are equally important for many applications. Light-starved NIR, Raman, and diffuse scattering measurements often struggle to acquire sufficient signal in a reasonable measurement time, and/or without being swamped by noise. Process & reaction monitoring, inspection, and mapping applications require high speed measurements to be practicable, but are only worthwhile if a certain SNR is met. 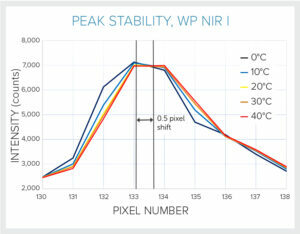 Our optical bench delivers both, even excelling in the NIR to deliver suprisingly high signal and SNR in a fraction of the time. Thermal stability is key in OEM spectrometers, as temperature can influence the peak shape, intensity, and centering that are crucial to many analysis algorithms. Our optomechanical design is highly tolerant to temperature changes, maintaining both consistent peak height and shape during temperature cycling. We see <0.5 pixels of thermal shift over 0-40ºC for our NIR spectrometer, and just 2 pixels for the WP 785 Raman, ensuring accurate analysis and dependable answers over a wide range of operating temperatures. For a prototype to become a product, it must lose weight and bulk as its components are streamlined and integrated. 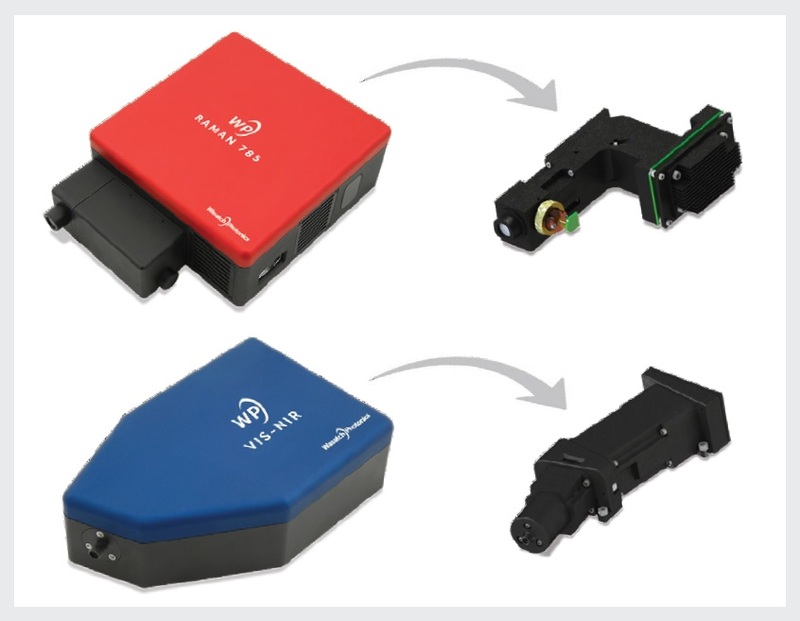 Our OEM spectrometers decouple the optics and electronics of our standard products, stripping away casings & mounting plates to facilitate compact integration without impacting performance. The modular nature of our optomechanical design also allows us to quickly build-to-print a wide range of configurations from the same cost-effective subcomponents, and to customize your design with bespoke gratings manufactured in-house. We believe spectroscopy has the potential to solve more problems than ever before, and we’ve designed our products to help do that faster. We’ve seen how one researcher’s bold idea can become a solution for thousands of people, and we know the power in nurturing each new possibility. So whether you’re an OEM in practice or an innovator in the making, we want to be part of your solution. Explore our OEM capabilities or contact us today to get started!